KAS Medical Center is dedicating the month of June to the men in your life. Today in the workforce, men are in a very stressful environment with competitive jobs, long hours and the pressure to stay ahead of the company rival. After all this, you have to look your best. Most men are going to parlors suggested by women, wives, girlfriends or sisters, without realizing that there needs are different. Men and women differ in their skin type and texture, fat distribution, muscle mass, grooming requirements and aesthetic appeal. This requires treatments for men and women to be different. At Center, we recognize this and have put together a program just for men. We have seen an increase in the number of men coming to Center to look their best. 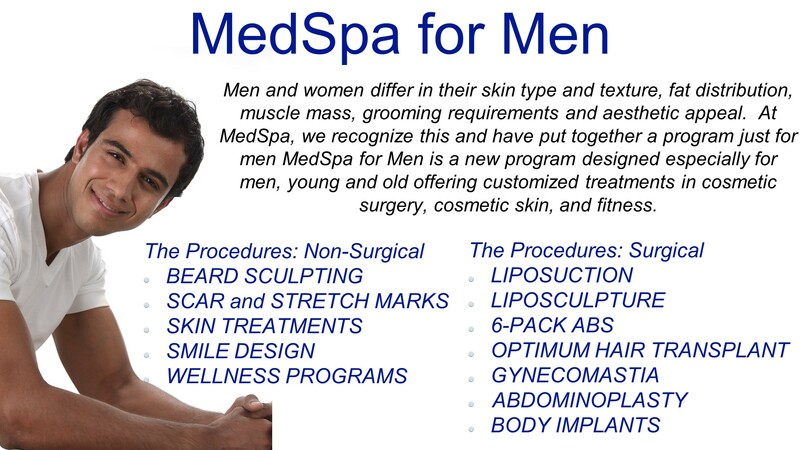 Whether you are 50 or 25, MedSpa helps you to look and feel your best, to stay ahead of the competition and feel confident. KAS Medical Center for Men is a new program designed especially for men, young and old offering customized treatments in cosmetic surgery, cosmetic skin care and fitness. Cosmetic Skin Care offer treatments for the skin including skin resurfacing, acne control, scar removal, pigmentation problems, facial fillers and wrinkle removal. Cosmetic Surgery (www.drkashyap.com) offers liposculpture to help sculpt your abs to give you the six-pack you have desired, liposuction to remove unwanted fat, facelift and blepharoplasty helps to erase the years, while chin implant and cheek implants help to chisel the face. Rhinoplasty (nose surgery) can help to bring your face into balance and increase confidence. This entry was posted in cosmetic surgery and tagged cosmetic skin care treatment, cosmetic surgeon for men, cosmetic surgery, eyelid surgery, face surgery, facial filler, facial hair transplant, gynecomastia, hair transplant surgery, liposuction, plastic surgery, rhinoplasty, six pack surgery, tummy tuck surgery, wrinkles removal by admin. Bookmark the permalink.